6/17/2008Share this story on Facebook! 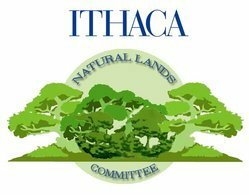 This Ithaca College Natural Lands Emblem was created by Julie Gutman '07. Gutman won the emblem contest held by ICNL in fall 2006. The Ithaca College Natural Lands Committee (ICNL) received the fifth annual Richard B. Fischer Environmental Conservation Recognition Award from the Town of Ithaca. The award was presented at a tree planting ceremony near the South Hill Recreation Way. The award recognizes the ICNL Committee’s work in using undeveloped properties as learning tools and contributing to the natural environment of the Town of Ithaca. The committee was organized in 2005 as a result of a dialogue between the Ithaca College Department of Biology and the college administration. It was to serve as an ongoing management entity for all of Ithaca College’s natural areas. Since its founding, the group has strived to develop guidelines for the appropriate use of lands owned by the college. They have established a sustainable timber management program, endangered species management protocols, and an invasive-species plan. The committee focuses on biodiversity, teaching and research opportunities, and ecosystem-function. The committee, composed of 17 staff, faculty, administrators and students, has devoted much of their time to the Bob Robinson Family Preserve, a college-owned property in Newfield, New York. The 82-acre preserve is designated as a Unique Natural Area. It encompasses the Van Buskirk Gorge and trout stream, and offers a unique example of a very diverse middle-aged forest. The committee also focuses on the 365 acres at the south end of campus, designated as the South Hill Natural Area. The area houses many different ecological communities, a host of rare plants, and a mix of wildlife species.